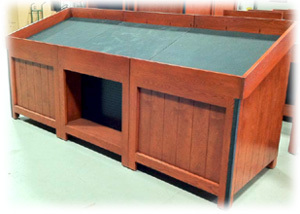 Here is a sneak peek at a brand new orchard bin we are introducing this spring. In fact, this photo shows one of the first bins to leave our warehouse. As their product name implies, these bins come with a slanted, angled top that props up fresh fruits and vegetables. This enhances the display to your customers, which can lead to increased sales. As a hybrid of our Frontier Orchard Bin and Eurotable products, these bins work quite well against a wall and/or side-by-side in a row. Slant Top Orchard Bins come in two distinct styles, no box and with box. Both styles can be intermixed, as shown here, to vary the look of your display. The box unit offers a great way to cross-merchandise . An accessory shelf can be added to the box unit for further flexibility in your display.